You've completed the vocational assessment within C'reer and tapped through to a list of careers that you might be interested in pursuing. Now what? How do you get from there to chatting with an admissions personal at a school? Here's a 1 minute visual tutorial. 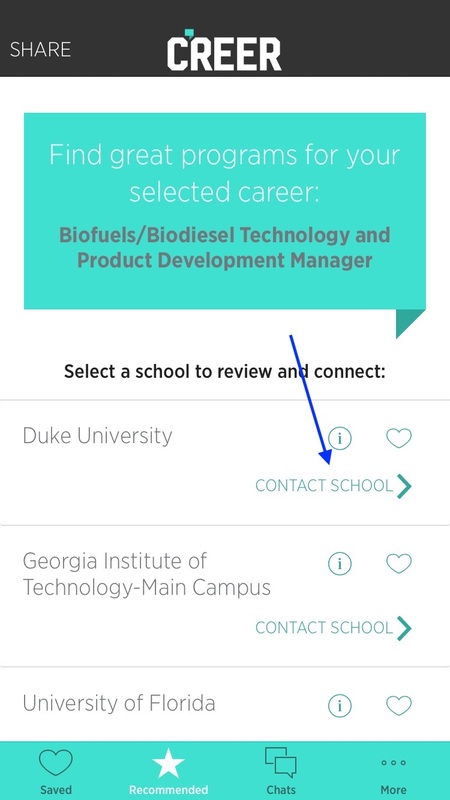 From the screen of recommended careers tap on one you want to know more about. In my case, it's Biofuel/Biodiesel Technology and Product Development Manager with one of the matched schools being Duke University. Check out the blue arrows on the screen by screen flow below. And, good chatting to you! Is your city aligned against your career and education interests? We just completed a 3-week pilot with Sacramento high school students and community colleges in late November. We saw very strong evidence that these students are most interested in Realistic career paths (working with tools, machines, animals) over the general population of C’reer users (we have users in 49 states). The implications for employers and educators in the region are potentially huge if they’re not ready for this next workforce to enter the market. These workers and students would simply move somewhere else for work and education that suits them. We’re working to launch more pilot programs around the country with high schools and college systems that serve them. Email us at info@creer.us if you're interested. You may have heard that we recently kicked off a pilot program using the C’reer mobile app to match students in Sacramento County, Calif., with career paths and the programs within the four-campus Los Rios Community College District that support those careers. Sixty percent of students researching college expect a response to their inquiry to you within the same day. Chat is a perfect medium for personal and real-time communication with high school students who don’t answer phone calls or have email installed on their mobile phones. The C'reer team was excited to be able to attend this year's National Conference on Student Recruitment, Marketing, and Retention.We learned a ton and got to share ideas with a lot of great professionals. With that we figured we'd share our Top 5 Takeaways from NCSRMR. It's been a few years (OK a few decades) since the C'reer team has taken the PSAT, SAT or ACT, but as deadlines for those tests loom (see below) we got to thinking of the best tips we received when we were prepping for the tests. We completed development of the career assessment that’s in C’reer a few months ago. In fact, it was probably the biggest undertaking in the first year of the company – to develop and prove a vocational assessment could be mobile friendly and scientifically accurate. With the app now in the market, we finally got some time to sit down with one of our lead researchers on the project – Dr. Jane Swanson – to reflect on the process and methodology that went into developing our assessment. C’reer: What were your initial thoughts when we proposed the idea of developing a vocational assessment specifically for mobile? JS: The underlying idea was intriguing, for a couple of reasons. First, there were the technological considerations. Other than the use of high-speed computers to expedite data processing, little has changed in measuring interests over the past 100 years. We had to consider how that longstanding approach would work in a mobile environment. Second, access to traditional career assessments is limited due to their control by mostly educational institutions, expense, and dependence on trained professionals to interpret the results. An assessment on a mobile platform changes that dynamic and expands the range of individuals that can take advantage of career assistance. C’reer: You’ve worked on the Strong Interest Inventory in the past — how was the process in developing the assessment in C’reer different or similar? JS: The work on the Strong Interest Inventory focused on gathering data from individuals in occupational criterion groups – the samples that are used to build scales measuring interest and similarity to people already in occupations. For C’reer, we started at the beginning, in terms of choosing, developing and evaluating items to use in the assessment. We also were working on a much shorter time interval for C’reer, from initial concept to viable product and targeting pre-career individuals as target and test groups. C’reer: Were there any surprises or a-ha moments in this for you? JS: We knew going into the design process that we could not utilize the large set of items that are typically found in normal career inventories. The C’reer assessment needed to be engaging, relatively quick to complete, and provide a smooth user experience. That meant showing one question at a time and balancing the right size rigor with the requirements of a mobile application. User feedback thus far indicates we’ve successfully achieved that. C’reer: What do you say to the person who gets an assessment recommendation and they say, ‘that’s not me’? JS: I’d want to know more about the person’s experience and in what context they took the assessment. What type of exposure have they had to career information or knowledge about the variety of careers available? In other words, is the assessment based on some real-world knowledge about the world of work? If the person does not have much hands-on experience, how might they go about obtaining this experience to augment or pursue additional information? Also, distraction can be factor when evaluating yourself for career potential – individuals should take care to respond quickly, going with their gut response, but not carelessly. C’reer: What do you think the biggest surprise will be for the person taking our assessment inside C’reer? JS: If they are used to traditional 100+ text based assessments, they will be surprised by how quickly they can engage with the questions and obtain results that can help them better understand their own career interests. They may have the same quick and relatively fun experience of taking a Buzzfeed quiz, but the outcome will be something far more useful and based on science! C’reer: Was the process in testing the various stages of the C’reer assessment different because it was intended solely for mobile? JS: Despite the mobile application, the development was still rooted in tried-and-true scientific methods. The same basic processes were followed in each stage of developing the assessment, including basing it on well-established theoretical constructs, writing high quality items using content experts, multiple pilot testing, choosing appropriate samples, refining items, and estimating reliability. C’reer: Did you have to rethink how you asked specific questions due to space constraints? JS: Yes, but that was the nature of the challenge. The items themselves needed to be short and to the point, and the number of items needed to be reduced, all to conform to the mobile platform. We also had to identify outdated questions in some of the older inventories and eliminate them. C’reer: What do you think the biggest challenges our assessment will get from educators and your fellow researchers? JS: The brevity of the assessment feature itself. Traditional psychometric methods build scales using considerable more items, which is a standard tenet of reliability – all things being equal, longer scales are more reliable. And reliability helps establish validity. In other words, larger assessments can be viewed as typically being more reliable. We put C’reer through multiple pilot tests and are confident that the length of the assessment in the C’reer app strikes the right balance between usability in a mobile platform and reliability. How do you think we can make the C’reer assessment better or more predictive? As you probably know by now, the idea behind C'reer is to make the career exploration process available to all students in this country, not just those who benefit from attending a wealthier high school with the best software and reasonable school counselor-to-student ratios. Much like like a teenager, a good mobile app goes through phases and changes. With nearly 1,500 people having downloaded and taken personality assessment we thought it would be a good time to take a look an early look at the trends and where are users are landing in terms of their personalities. The C'reer leadership was thrilled to meet with students from Beaufort High to receive their feedback about C'reer. As our CTO Wally Holt very eloquently put it in our first live demo of C’reer, we’re not trying to be the Yelp for careers and colleges. We’re trying to add more value than simply giving you results based on what is immediately nearby but rather we’re sourcing the best performing programs that just happens to be regional. The C'reer team was excited to have the opportunity to demo our product and answer some questions at the Beaufort Digital Corridor's inaugural installment of Fridays @ The Corridor. Today’s high school counselors are doing much more than simply giving ‘guidance.’ That's why the American School Counselor Association (ASCA) and 2017 school counselor of the year Terri Tchorzynski are celebrating National School Counseling Week by telling everyone that the job title ‘guidance counselor’ is old-school, today is the day of the school counselor. Today's teens won't wait seven days for you! Today’s teens are all about immediate gratification and communication. Whether’s it’s a tweet, snap or text, the way today’s teens communicate has become faster and most of it is occurring on their phones. Why does C'reer ask for your location? Where should I go to school? It’s a question high-schoolers have been asking for decades. And an extremely important factor in coming up with an answer to that question is the actual physical location of a school. What technology can't you live without? This past weekend we announced a new scholarship, which is available to any high school senior residing in the state of Georgia. The C’reer Scholarship - administered by UrbanSTEM - can be used for the purchase of educational technology. I had my first editorial published when I was 12. I’ve been writing ever since. I took that creative bent and passion for writing into an undergrad degree in journalism and a graduate degree in screenwriting.